I occasionally work with Babbel, a language-learning app based in Berlin. 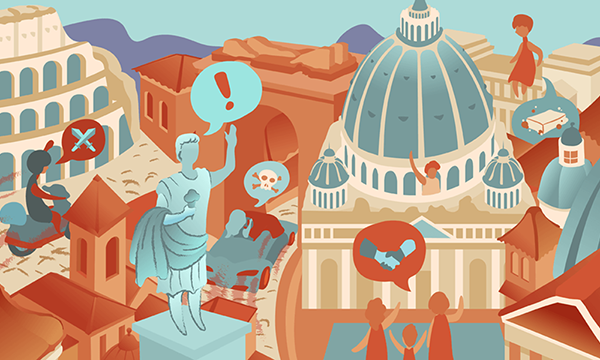 They also publish an online magazine, and commissioned me to illustrate an article about Roman dialects and the particular words and phrases you won’t hear anywhere else! I remember visiting Rome for the first time around 2006. It’s big, noisy, and chaotic at times, and I wanted the illustration to capture that feeling. I also spent a lot of time thinking about how to thoughtfully portray Roman culture without resorting to stereotypes about Italian people or tropes about ancient Roman culture. In the end I included the landmarks that Rome is famous for, plus a few classic Italian cultural references in the form of gelato, scooters, and beautiful cars. It’s a challenge to make such a chaotic drawing read correctly and I’m proud of my results!